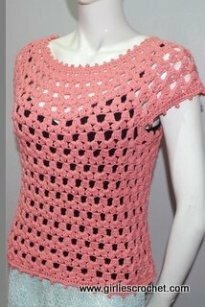 Please click here for Crocheted Bolero Pattern. 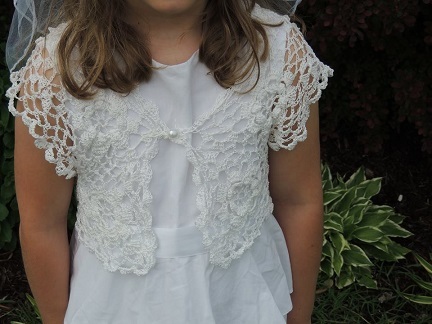 This is my granddaughter's communion dress with crocheted bolero. 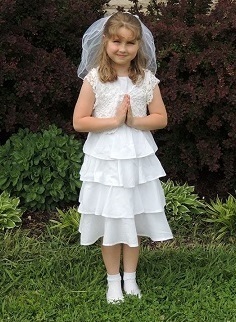 My granddaughter makes her First Communion last May 5. 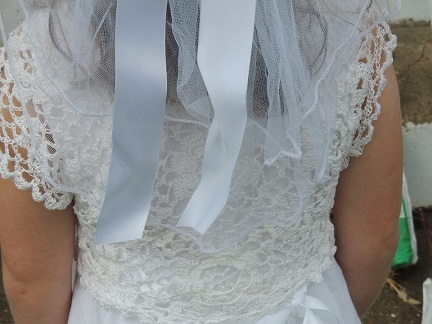 The communion dress fabric is very plain batiste. 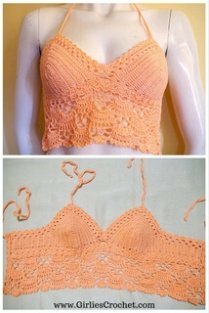 The lace crocheted bolero is just beautiful with it. 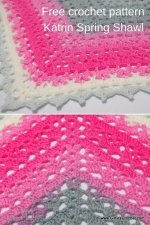 I have crocheted a great deal, generally I don't like making Granny squares and I have never crocheted lace. 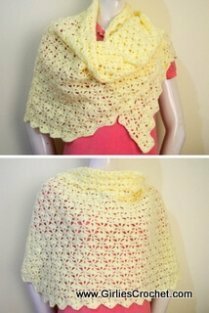 My grandmother taught me to crochet when I was very young and she made doilies. So I have used fine thread but a very long time ago. I also made her communion dress. We wanted something that could be worn again. The dress is made of batiste fabric, sleeveless and the ribbon (not well pictured) sash can be changed to another color or the dress pattern actually has a cummerbund. 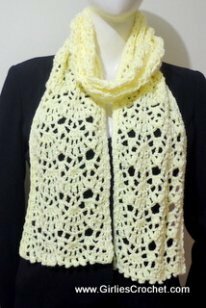 The front of the bolero is closed with a single pearl-like button instead of the crocheted ties. I did have some trouble attaching the motifs to each other but I doubt that the average observer can spot the mistakes. I would not want you to examine my work very closely. I was worried about my daughter and granddaughter liking it but they did. I was extremely pleased with the overall appearance of the ensemble as it looked just the way I imagined. Thank you so much for you’re helped. I definitely would have not completed the bolero without your assistance. 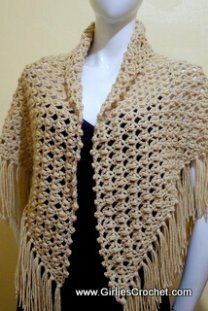 I am seriously considering making something similar for each of my daughters and daughters-in-law for birthday or Christmas gifts. Thanks. I really am very pleased with the results. Again, thanks for your help. I love that someone half way around the world helped me.